Listen: Shopping for children is one of those nightmares they don’t bring up in parenting guidebooks. It’s a marathon, up there in Parenting Hell, right next to dropping your kid off at preschool for the first time. Pick the wrong thing and tears will be shed and fights will be fought. But find the right item and your kid will be so happy, they’ll turn into an actual angel with wings and a freakin’ halo. It’s a shopping miracle. This is possible. You can find clothes that are stylish, comfortable, and wearable. When you arm yourself with facts on what fabrics will hold up to all of your kids’ activities, as well as the styles they’ll want to wear, shopping will be easier and dare we say, pleasant. 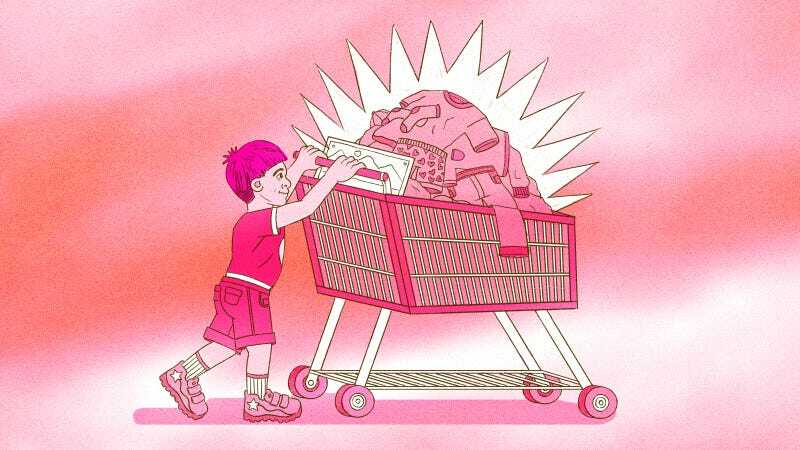 Here’s how to find clothes for your kids. Kids are prone to meltdowns, trigged by anything from their cereal being too cold to you not letting them flush their goldfish down the toilet. A tight or restrictive sweatshirt, for example, will bother any kid, especially if they’re unable to remove or adjust it. That’s why comfort is your top priority when shopping for your kid. Everything — from shirts, to sweaters, to coats — should be easy to wear throughout the day. Run your hand over all fabrics and avoid items that are itchy or restrictive just because they’re cute — it’s just not worth the tantrum. Michel Onofrio has been a fashion stylist for 20 years, working with a number of high-end brands, including Appaman. She recommends that clothes should move with your child. Look for clothes that they can jump around in, without a bunch of unnecessary pockets, itchy frills, or distracting zippers. Appaman has clothes that are soft and flexible, so your kid won’t feel confined. Katie Elks, an apparel product developer, similarly recommends t-shirts and sweatshirts that are easy to pull on. “Picture yourself as a kid when you tried to put on a sweater with a small hole and were stuck for a bit. So scary,” she explains. Pull-on pants are also good options, she says, as are adaptable clothes, such as waists that cinch or adjustable overall straps. Kids run around in mud, spill everything they get their hands on, eat actual worms, and are generally dirty monsters. Fabrics should stand up to that activity level. For everyday clothes, Elks suggests going with natural fibers like cotton or fine wool. Cotton, in particular, is machine washable and can be bleached depending on the colors, she explains. Onofrio explains similarly that parents should look for soft cottons such as brushed, Pima, and pre-washed cottons. Fabrics with Lycra will stretch and allow for movement, she explains. Functional items like winter coats should be able to withstand the elements but also allow for movement. Soft fabrics — including both shells and trims — are still a priority with winter gear but you should also consider how your kid will feel wearing this every day for the entire winter. To that end, look for breathable materials that will keep the warmth in without the bulk. Down is a great option since it’s super cozy but easy to pack into a locker or backpack. Figuring out what’s in fashion for kids is like trying to decipher a puzzle in a different language with no instructions. What your kid thinks is fashionable will vastly differ from your own sense of style. Onofrio advises parents to “know what colors and shapes look best on your kids, take into consideration their lifestyle” when shopping. She also explains that friends, television, Instagram, and celebrities most impact what girls think is stylish. Boys also look at their friends for style inspiration, but comfort is most important to them. One way to make this easier is to find clothes that have a unique or fun detail that your kid can latch on to. Clothes from Appaman, for example, come with a monkey logo on a patch or zipper pull that children will be excited to throw on every morning. Size is essential here, too. Clothes that fit properly will naturally look better and be more comfortable. You should also pay attention to how they react right when they try on their clothes for the first time. If they’re excited about something, they’ll show it. The happier they are, the more confident they’ll feel, which takes the hassle out of getting dressed each morning. Following all of the above principles, formalwear should not be too stuffy or uncomfortable. Find soft, comfortable clothes in a modern fit, and your kid will be excited to dress up for a special event. This is especially true for boys. When a boy gets to wear a suit that matches his dad’s, or can pick out a fun tie for himself, it’ll be way easier to get him dressed. And listen: do you really want to put your kid in an outfit that’s dry clean only? Remember: This is the being that tried to put spaghetti up their nostrils while singing the ABCs backwards. Skip the items with complicated care instructions until your kid is old enough to do their laundry their own damn self. Instead, choose a suit or dress that looks good, feels good, and importantly, can be easily washed. The bottom line is that while clothing is functional, it should also make you feel good. That goes for kids, too. Helping them find clothes that are comfortable, stylish, and sized correctly will make getting dressed every morning way more enjoyable. Nandita Raghuram is the Content Director at Studio@Gizmodo. She tweets here. This post is a sponsored collaboration between Appaman and Studio@Gizmodo.